Yes, it really was like this four months ago exactly ! To the day ! So hard to believe on this hot, sunny day.Cold, snowy, staying by the fire sort of weather, but I did venture out to take some photos of this little corner. On days like that, I dreamed of days like these, and now those days are here, I never want them to slip away. The snows of March finally went leaving the soil cold and wet, with no hint of Spring. 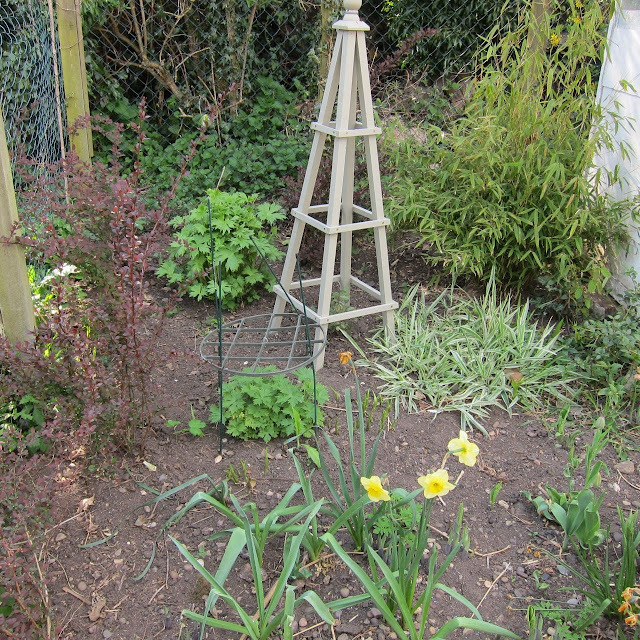 In April, when the soil was vaguely workable, I ventured outside again and dug out the wobbly old broom in the left of the photo, which was hanging onto life by a thread. I replaced it with a cutting of a climbing rose, 'Cinderella', which I had taken the previous summer. 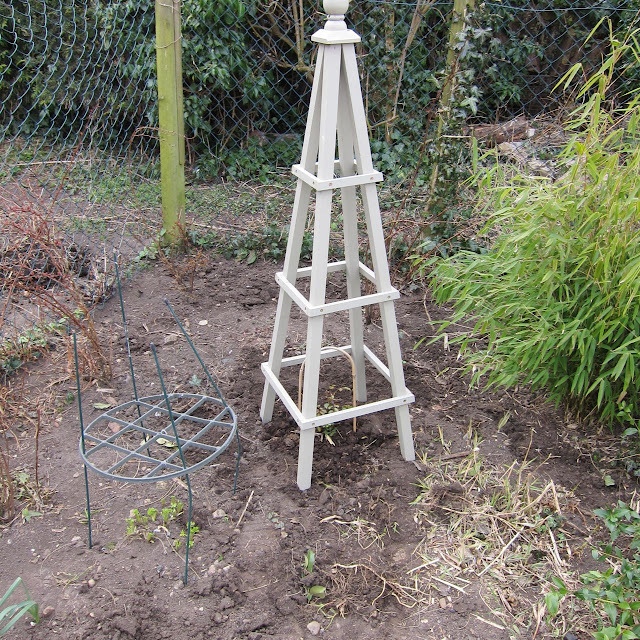 I put in an obelisk to support it, too. 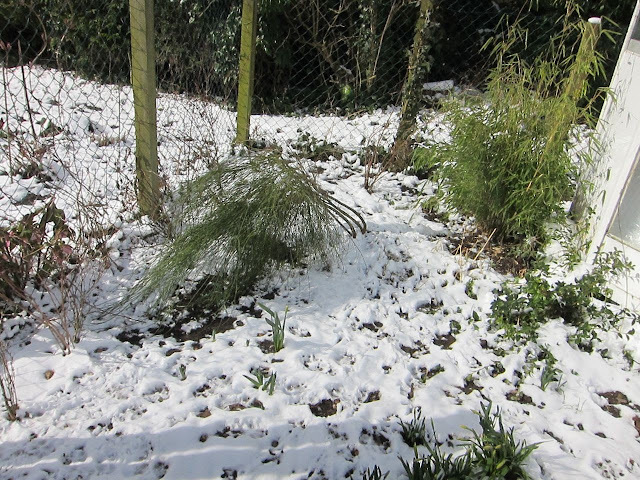 I think it is sheer optimism which propels gardeners into the garden at this time, as it so hard to visualise what the season's growth will do. This is early May and only a couple of weeks later, but there is a lot more growth evident. 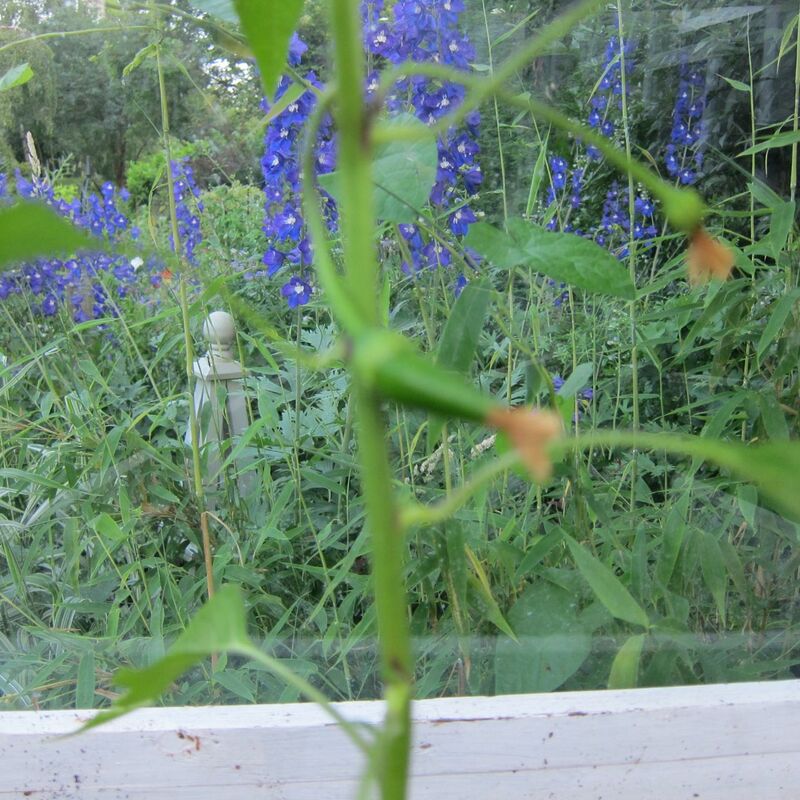 The delphiniums are through, as are the 'Gardener's Gaiters' (variegated grass). 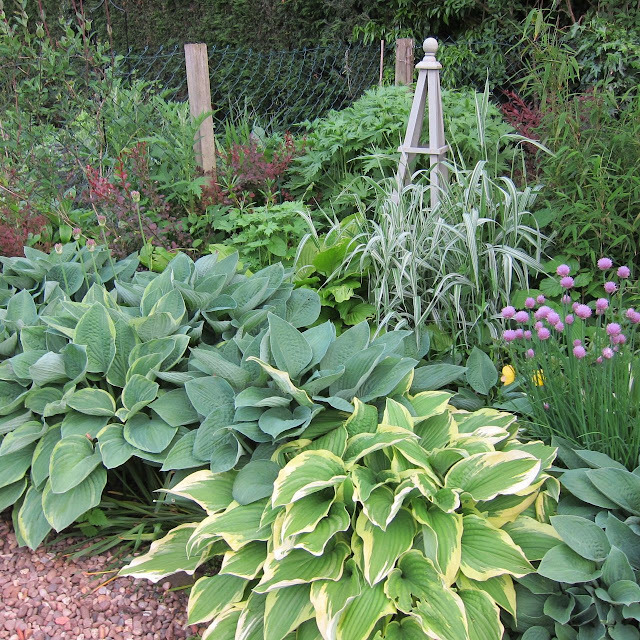 This is June and everything is nearly at its peak, the hostas are out and the delphiniums are growing fast. Apologies for the July shot ! For some reason, I omitted to take a photo of the bed when the delphiniums were out, but if you peep past the chilli plant in the greenhouse you can just see the sea of blue through the window ! The next months will bring cutting back and dying back and ... oh no ! the snow ! I'm loving the new blog. Beautiful garden! It is amazing what plants do, isn't it? Every winter I think I don't have enough plants, but in summer they are overcrowding each other. I love that grass and the hostas. They make a beautiful picture even if there were no flowers. Hi Lyn. It is so hard to visualise in March, what things will be like in June. I have to take oodles of photos so that I can look at them in the lean months and remember how things will be ! I don't want to think about the white stuff! I really don't mind the heat, and now ours is slipping away. :( I sure hope we have plenty more warm summer days, because they are my favorites! No, I don't want to think about the white stuff either ! I love the summer and each day is sooo precious ! It is neat to see the transformation from winter to spring to summer. Your snowy picture is a great reminder to enjoy the warm, sunny weather while we can. Already I am noticing subtle shifts toward fall. The mornings are cool and it was dark when we got up today. Happy gardening this weekend Jane! Hi Jennifer, thanks for your comments . Happy gardening to you too.